Carson's Grandpa is a brand of Dias JR Distributing based out of Bakersfield, CA. Dias JR supplies convenience stores with meat snacks, candies, and vitamins, but it appears that beef jerky is their biggest product. The company doesn't make their own jerky, rather it's private labeled through Werner Gourmet Meat Snacks of Tillamook, OR. Werner makes beef jerky for a wide variety of other brands, including distributors like Dias JR. Read my previous reviews of Werner Beef Jerky, as well as Branding Iron Beef Jerky, another brand they manufacture. This "Western Style" appears to be the same style cut that Werner is known for. Carson's Grandpa also offers a slab style, which I did not purchase. Beef, Brown Sugar, Water, Salt, Spice, Worcestershire Sauce, Monosodium Glutamate, Garlic Powder, Citric Acid, Sodium Nitrite. The first thing I taste from the surface of these pieces is a light sweet, followed quickly by a chile pepper flavor more comparable to jalapeno. Within seconds I pick up some spicy heat. Sucking on these pieces some more results in a light saltiness. The chewing flavor starts off with a little bit more sweet, and an increased chile pepper flavor, as well as an increased chile pepper burn. For being labeled as "Hot", this jerky seems to live up to that billing well enough. I wouldn't rate this "hot" on my personal hot scale, it's more like medium to me. 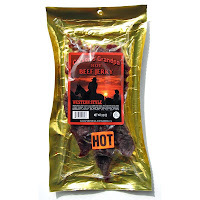 But I think those of you who love hot jerky will still get enough heat to be content, while those of you who haven't built up a tolerance for hot foods will most likely find this hot. But in addition to the heat, I'm also getting some chile pepper flavor, more similar to that of raw jalapeno. It's not an overwhelming flavor, but strong enough to make itself known easily. Looking closely at these pieces, I can see some darkened, gray-green chunks, which perhaps suggests jalapeno. There's also a good deal of sweetness to this, which is apparent immediately after putting a piece into my mouth, and lasting most of the way through the chewing. The saltiness in this is seems moderate. I don't really pick up any natural meat flavors. The worcestershire sauce and garlic powder mentioned in the ingredients list is difficult to identify separately. The worcestershire is lightly noticeable in some pieces, and difficult to taste in others. The same with the garlic powder. Overall, if I had to pick out one flavor component that best represents this jerky, it's the sweetness. It's not that it's the most strongest, but seems to sit center stage on my tongue, and remains almost all the way through the chewing. The jalapeno flavor is easily noticed throughout the chewing but seems to linger in the back and sides of my tongue. The heat, as I said above, is quite noticeable. The moderate saltiness, with the light showing of worcestershire and garlic, creates a tasty base flavor. These are slices of whole meat, sliced to a medium thickness, and in strips of about 3-4 inches in length. The chewing texture starts out feeling stiff and chewy for the most part, with some pieces feeling a little more soft. Once I start chewing it breaks down eventually, and in about 20-30 seconds of chewing, reduces down to a soft mass. At that point, it has some resemblance to a piece of steak, but with some slight mushiness. It's probably more comparable to a medium cooked steak. Most of these pieces appear to be quite lean, though I found one piece is a noticeable streak of fat. Otherwise, I don't see any gristle or tendon, and the chewing did not reveal any stringiness or unchewable wads of tissue. 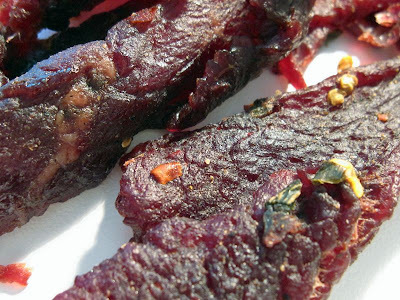 This jerky is also fairly clean eating, encountering only a little bit of stickiness from a few pieces. I paid $4.99 for this 3.2oz package from a Fastrip Food Store in Coachella, CA. That works out to a price of $1.56 per ounce. For general jerky snacking purposes, it's a good value. I'm actually getting a decent amount of snackability from that good showing of jalapeno chile flavor and the chile pepper heat, as well as a good base flavor from the sweet, salty, worcestershire and garlic. The meat consistency and chewing texture seems decent as well. Considering the $1.56 price per ounce is actually lower than what you'd pay for the mass-market brands at the grocery store, it's a good deal. As a Hot beef jerky, at the same $1.56 price per ounce, it's also a good value. I'm getting a decent amount of chile pepper heat, more than what I'd get from the large market brands, which will cost you a little bit more. 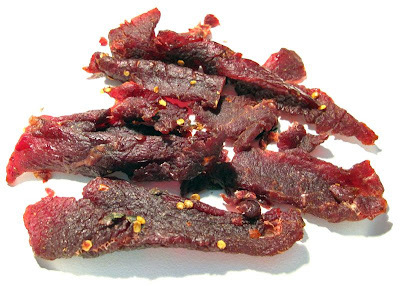 This Hot, Western Style of beef jerky from Carson's Grandpa is quite pleasing in taste, consistency and texture. It lives up to its billing as "Hot", providing a decent amount of chile pepper burn. But I'm also tasting the chile pepper flavor, more like jalapeno. Add to that a tasty base flavor, a little heavier on the sweet side, and it creates a good amount of snackability. And the overall meat consistency seems good, being mostly all meat and nothing stringy or unchewable, and mostly easy to eat. The chewing texture, once it got down to a soft mass, felt a little mushy, but still resembled something like real meat. Based on its lower price point, it appears Carson's Grandpa beef jerky is designed to compete against the big name brands on price, but choosing Werner Gourmet Meat Snacks as their manufacturer turned out to be a good move taste-wise. For my recommended beer pairing, I'd go with a Porter. Does anyone know some good expensive beef jerky? I'm just looking to ball out with some jerk. Would kobe be the way to go? Stay away from Kobe beef jerky, it's very greasy only because Kobe is naturally very fatty. Carsons grandpa's jerky is aweful. It's 12.00 for a bag and it is so marbled with hard fat and gristle that you can't chew a piece without breaking your jaw. I am pissed that I wasted money on such an awful product. Highly disappionted! I wholeheartedly DISAGREE. My wife brought a bag home from the road. I found it to be 4.5 on a 5 scale.